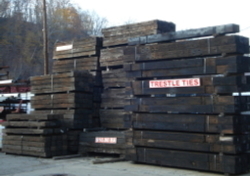 We sell used railroad ties of the highest quality in Pittsburgh. Ties may be used for landscape outlines, retaining walls, yard steps, flower boxes, or for any other use that your imagination can design. Custom cut-to-length ties for your special needs and delivery options are available, but please call for pricing. Ties are offered in several different sizes and quality grades, however the most common primary mainline rail road tie is 7" x 9" x 8.5'. 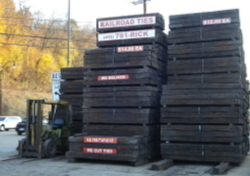 All ties are genuine, used, and treated per railroad standards. We maintain a wide variety of choices, however it's possible that not all ties are currently in stock, so please call first to verify availability. All ties are 7" x 9" x 8.5'. Ties are banded in bundles of 12 or 16, but can be sold individually. Switch Ties / "Long Ties"
Standard size: 7" x 9"
We'll load your purchases for you! Advisory: Free loading offered only on suitable vehicles with legal weight capacity (with the exception of passenger cars). 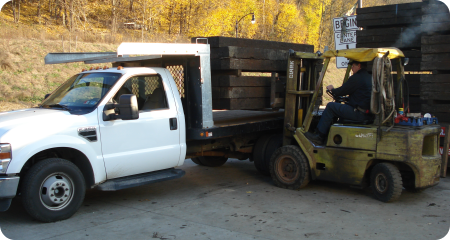 Additionaly, please be aware that railroad ties are heavy, the wood is splintered, porous, and is chemically treated. Please wear appropriate safety gear and take appropriate safety measures when handling ties. Thank you.